Raises funds for the provision of education and services, while advocating for our cause and breaking ground toward a cure. Since 2000, Team Diabetes members have been leaders in the fight against diabetes, raising much needed funds for Diabetes Canada. Why do I run for Team Diabetes? 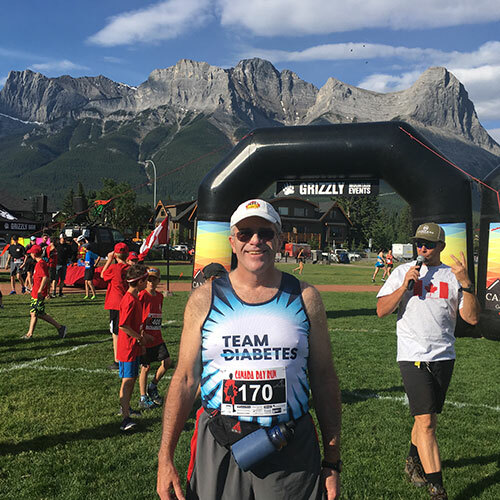 For Stanley Williams it has been an honour to represent Team Diabetes in several national and international events, including his hometown Calgary and internationally in Reykjavik, Munich and Disney World. 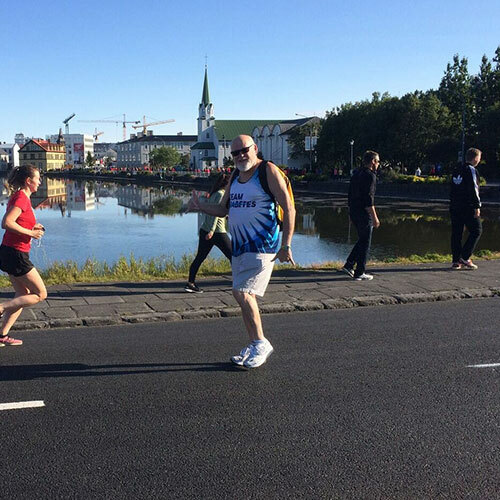 He is also excited to be running for Team Diabetes in Honolulu this December and then returning to Dublin in 2018. To date he has raised over $25,000 toward diabetes research and D-camps for children living with Type 1 diabetes. Why does he run and fundraise you ask? For Stan it’s an important cause because of his wife, who has lived with Type 1 diabetes for 43 years. He has seen first-hand the amount of daily care required, and witnessed how serious the complications can be. He once even worked out that she has taken over 100,000 insulin injections to manage her diabetes over the years. With a family history of diabetes, he is also trying to prevent Type 2 diabetes himself, and believes the hundreds of miles that go towards training may help to prevent it. He hopes that one day, all the miles, events and funds raised will help Diabetes Canada put an END to diabetes once and for all. I was diagnosed with Type 2 Diabetes in January 2001. Needless to say I realized I had to do something to change my lifestyle. I weighed 300 lbs and smoked 2 packs of cigarettes a day. The smoking stopped immediately and I joined a gym to start my new life path. Took a little longer for the weight but I am now down to 195 lbs. The gym got boring (for me) so I started looking around for something different. That’s when I heard about TEAM Diabetes! I had been a runner in High School and thought “this might be interesting”. Their philosophy and the fact we raise money for research, and especially our DCamps was a major factor in joining. I signed up and my 1st event was Iceland in 2005. I have now been a participant in 35 events and have raised a fairly large sum of money for the cause since that day. Signing up with TEAM Diabetes was probably one of the smartest things I have ever done in my life. I was embraced by the TEAM D staff and the participants immediately. I really felt at home. It changed my attitude and I now found myself being an advocate for healthy lifestyles and being active. More importantly, I have found a new Family from Coast to Coast to Coast. We are all very supportive of one another. While we don’t see each other on a regular basis, we do keep in touch and usually end up meeting again at another event. It’s like a reunion! I would do anything for my Family. Whether out on the course or in our day to day life. We are there for each other. As a matter of fact, when my Parents passed away, members of TEAM D attended their funerals. That meant a lot to me. We must find a Cure and I will continue with my TEAM D Family as long as I am able!